Volleyball net rule for USAV. The following are the rules for the net contact in USA Volleyball. Net contact isn't a fault unless the player interferes with play. The following are examples of player interference. Touching the top band of the net or top 80cm of the antenna during his/her action of playing the ball. Taking support from the net simultaneously with playing the ball. Creating an advantage over the opponent. Making actions which hinder an opponent's legitimate attempt to play the ball. Players may touch the post, ropes, or any other object outside the antenna, including the net itself, provided that it does not interfere with play. Contact with the net outside the antenna is legal. It's even legal to contact the top tape outside the antenna. It's only illegal if the contact interferes with play. Do NOT whistle because of movement of the net. Also, don't let players or coaches talk you into making a net call. Only whistle when there is interference with the play, the player uses the net as an advantage, or the net contact hinders the opponents' attempt to play the ball. The purpose of the new net rule is to allow for longer volleys. Volleyball will be more exciting when letting the net contacts that occur away from the ball happen and not whistle, ending a great rally. Setting the ball and then backing into the body of the net. For example, if the pass is tight to the net and the setter sets the ball then brushes up against the net, the contact is legal because the player didn't make contact with the top tape. Making contact with the net while setting the ball to a teammate. If the setter is in the net or sets the ball then lands in the net, this net contact is legal as long as the contact doesn't create an advantage, interfere with play, and there isn't contact with the top tape. Remember, players and coaches aren't yet used to the new net rules. Many coaches and players will grumble about the nets not being called. It's important to not let players and coaches influence your judgment. Contacting the top tape is interference. Contacting the top tape while hitting and blocking are the most common net faults. Remember, if you see a player contact the net, you must see the player contact the top tape before you blow the whistle. Pulling on the net while making the play. Pulling on the net while spiking would be a net fault because the player would be creating an advantage. Pushing your hands into the net to interfere with the opponent making a play. 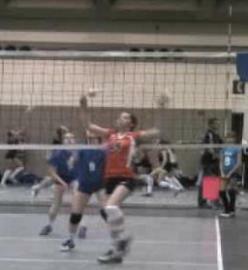 This net contact would be illegal because this net contact would hinder the opponents play on the ball. Leaning on the net while saving the ball. This net contact is illegal if in the officials judgment, the player used the net as support to make a play.